My cup is always with me. I am a bit of an aquaholic. Water within reach at all times. 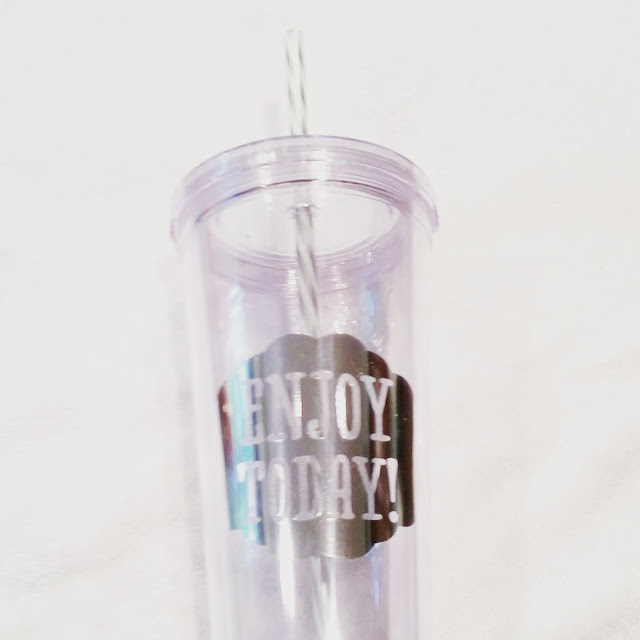 This cup is my sidekick and my moment by moment reminder to ENJOY TODAY! I am not good at doing it all the time, but now I am consistently reminded to let go of the anxiety and doubt that came yesterday and that I fear in the tomorrows to come. People say things. People do things. Not all of it is restorative or kind. It is extremely easy to take things personally. Some things sting regardless. And that is where my mind inevitably goes. Right to the offense. Only to get bogged down there forever. When I say I am an over analyzer I am putting it very mildly. I have a tendency to doggedly cling to emotional injuries. It is a completely self destructive way to function. Seriously. It is masochistic. It is also very limiting since I do not have the capacity to hang on to that sort of baggage and still be a loving person. I simply do not have the bandwidth for both. When I am nursing my pain I am all about the hurt and there is no space for anyone or anything else. I have to constantly cultivate the ability to jettison the junk. I can't look offense in its ugly face and hold it preciously like it's going to help me. I can't give bitterness any place in my thoughts. I need time and space for other things that serve me better than grievances do.